I went to culinary school and spent many years in the food industry prior to career changing and for the past 5-10 years, this piece of cookware has been my favorite. If I had all the money in the world, all my pots and pans would be this brand, but alas! I'm a poor teacher! I love this product for its uniform heat distribution, heavy bottom, and versatility. I've cooked everything in it from French caramel candies to red wine braised short ribs. It allows for a great sear on meat; and also no hotspots when making something like caramel. My only complaint is that it does scratch and discolor over time, but not any more than expected. It is incredibly pricey, but worth the cost in the end, because one of these pots may last almost your lifetime. We were given one as a gift a couple of years ago. It was great until it slipped off the Aga. It broke into three pieces. Le Creuset claimed the 'lifetime warranty' was invalidated because we knocked it off the Aga. Crockery and glasses have suffered the same impact and not broken. In the USA, I have been told, we would have likely got 75% off the replacement. 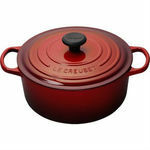 Le Creuset do not provide American style customer service in Europe so no luck here. We've replaced it with a Lodge which is a quarter of the price and seems to be identical, both in terms of the expert reviews and in our own experience. I seriously love Le Creuset! I only have their dutch oven because I cannot afford to get the whole set. This is something that I would invest in if you are just starting a family or need your own set of pots/pans because you are just moving out. They are such high quality and last forever. I got mine as a hand me down from my parents as they purchased a new set. Even after being used for ten years prior, I felt as if I was getting a brand new product! It looks and feels brand new. It does not get scratched or scuffed from general usage. It heats the food up so evenly that it cooks your food to perfection. I would definitely recommend spending the extra money so you can invest in a great product that will last you for generations. This is the best product on the market! Doesn't Stick I have never had any of my food get stuck to the bottom of the pot. It makes it super easy to clean and you do not even have to soak the dishes over night. A must-have for any kitchen! I really love this oven. I use it year-round to make sauces, soups, braises, etc. It holds a lot of food, but I find that even when cooking for 2 it isn't impossibly big and I wouldn't dream of making chicken with forty cloves of garlic or a pot of chilli without it! Although I have heard some complain that the enamel stains, I find it incredibly easy to clean, even easier than regular cast-iron. I have had mine for about 4 years and it looks nearly new. Further, it works amazingly well even on a cheap stove like mine because it distributes heat really evenly. Regardless of what kind of food you like to cook, this piece is indispensable. Of course we use it for making a lot of classic French and Italian dishes, but it also works really well when frying because it holds a lot of oil with lots of room left (i.e. less danger for grease fires), heats evenly, and holds the heat in so you aren't constantly adjusting the burner just to maintain a good frying temperature. I highly recommend purchasing one-- they make great wedding and housewarming gifts, too! I love my Le Creuset french oven pot which I received as a gift. It is great for roasting chickens or stews. I love that I can take it from the stove to the oven without worrying that it will melt. The fact that it has a ceramic coating on the inside means nothing will stick or burn. Such a high quality product. I would recommend this pot to anyone looking for something that will last them a lifetime. 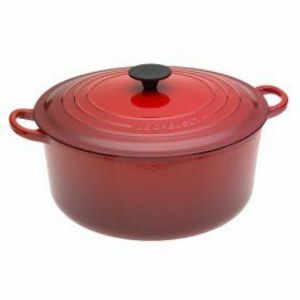 Doesn't Stick The ceramic coating on the Le Creuset french oven pot nonstick. Though I still like to use a little oil in case the food burns. I don't want to ruin the coating. Heat Distribution The heat distributes evenly on the Le Creuset french oven pot. There are never any cold spots because it is made out of cast iron. Ease of Handling The french oven pot is extremely heavy because it is made out of cast iron. It is even heavier when you add the lid on top. But the handles on the side make it easy to move from stove to oven with a breeze. Ease of Cleaning It is very easy to clean the french oven pot. I just clean it with soap and water. Design The french oven pot is designed very nicely. The pot comes in a variety of colors. The handles make it easy to carry despite the weight of it. Durability The heavy cast iron pot feels like it will last a lifetime. The nice coat of paint on the pot doesn't look like it will chip off unless it fell on the floor. This cookware it the best out there for the cook who wants to cook like a chef. I use this pot for just about every thing I make that requires liquid. It always heats evenly and allows for nice find or crusting on the bottom when starting your soups and stews providing great flavor and simmers nice and evenly. The cover is nice and heavy allowing for a nice seal to keep your food from drying out. It's also good for pot roast and once again Allie a nice crust to firm evenly with burning. Everything that I make in this pit taste do much better than in regular old stainless steel or any other lighter cookware. The cast iron just heats great and stays consistent. Doesn't Stick As long as you are careful in regulating you heat when browning off you roll find that your food first stick yet creates that nice fond (or crust if you will) that give your good that rich deep flavor. Heat Distribution The cast iron give you the best heat distribution above all others. Ease of Handling It's heavy but worth it. Heavy is good! Ease of Cleaning It cleans up pretty well. Just do not use something heavily abrasive. The enamel is tough but it will scratch. If you use improper cleaning scrubber. Durability Tough as nails. I've had mine for 25 years. Still beautiful and sits on my stove as decoration. I have never owned a Le Creuset item before because they were very expensive. For our wedding I decided I'd ask for a Le Creuset French Oven. I will never go back to lesser items. This is good quality, the food I make using it is delicious, and it's very easy to clean. Other imitation items tend to get cruddy really easily. They can be difficult to clean and, although I would not put this in the dishwasher It is very easy to wash out in the sink. I have a 6.75 Qt. and it is a little large, a little heavy, but totally worth it for the amount of food I can make using it. Doesn't Stick It does not stick, although I usually use a spray to be doubly sure. Heat Distribution even. Ease of Handling It is heavier than other kitchen items, but the quality of the item and the food made in it is worth the effort. Ease of Cleaning I wouldn't put this in a dishwasher, but it is very easy to clean in the sink. A lot of people think that dutch ovens aka French ovens are good for even heat. That is not really true outside of an oven, though! Cast iron, enameled or not, is not a great heat conductor, so hot spots develop easily on the stovetop. Where cast iron shines is keeping stuff warm (thick iron holds heat and doesn't give it up easily), and in the oven where the heat is more even. I have used this product for braises mostly, which is basically like a cross between boiling and steaming food at moderate temperatures. This barely-simmering temperature, if you give it several hours of time, will break down the connective tissues and make meat tender--even cheap cuts! In that regard this cast iron dutch oven has been great. It also cleans up easily as well because it is enameled, so you do not have to worry about acidic foods rubbing off iron molecules or anything. 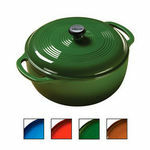 You can get a cheaper dutch oven, but it may not last as long and have the long warranty that Le Creuset does. Staub is the only real competitor in that regard. 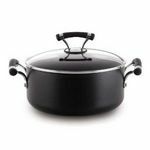 I hear both terms interchanged a lot with this cookware... French Oven... Dutch Oven... they're pretty much the same in my book, but even though this is called a French oven, I'm sticking with Dutch Oven for the rest of the review. Le Creuset is one of the best cookware companies out there, and this Dutch Oven holds up among the best of the best. What I like most about it is its even heat distribution and its tight fitting lid -- it has a perfect seal around the top. I've used other Dutch ovens that had great heating distribution but their one huge flaw was the seal of the lid on the top. You had to wiggle it around in just the right spot & angle for the lid to rest securely on the top of the pot, otherwise the steam would escape. And that just defeats the purpose. But Le Creuset's Dutch oven doesn't do that. I use this for making pot roasts, vegetables, fish, poultry, even desserts. I'd give it a 5 star rating except for the price. This Dutch oven is very expensive! As they say, you get what you pay for, and in this case I couldn't agree more. The quality really does stand out, and I don't think I'll ever have to pay for a Dutch oven again.